9 July 2015 – Fast cuts to short-lived climate pollutants will provide both short-term climate mitigation as well as the political confidence necessary for a broader international climate deal in Paris in December, according to a Nature Climate Change commentary to be published 13 July. Short-lived climate pollutants include black carbon, hydrofluorocarbons (HFCs), and methane, the main component of smog, or ground level ozone. “Unlike long-lived CO2 emissions which remain in the atmosphere for hundreds to thousands of years, short-lived pollutants remain in the atmosphere for just days to a few decades, and cutting them will reduce the rate of warming within a decade,” said co-author Veerabhadran Ramanthan, a distinguished professor of climate and atmospheric sciences at Scripps Institution of Oceanography, UC San Diego, and UNESCO Professor of Climate and Policy, TERI University, Delhi, India. “The fresh scientific insights about short-lived climate pollutants are opening up a new political front in the battle to mitigate climate change,” said lead author David Victor, a professor at UC San Diego. “Technologies exist today to reduce up to 30 percent of methane, 75 percent of black carbon, and nearly 100 percent of potent HFCs” said co-author Durwood Zaelke, President of the Institute for Governance & Sustainable Development. “This would avoid up to 0.6°C (1.1° F) of warming by mid-century, in addition to slowing sea-level rise (see Figure), the melting of glaciers, and the retreat of the Arctic ice cap,” said Ramanathan. Those submitting formal proposals include the island collation lead by the Federated States of Micronesia, the first country to propose cutting HFCs, as well as the U.S., Canada, and Mexico, the EU-28, the Africa Group of 55 countries, and India. “The amendment could pass as early as November this year, although opposition remains from the Gulf States”, Zaelke said. The Climate and Clean Air Coalition to Reduce Short-Lived Climate Pollutants (CCAC) currently supports government and NGO representatives working to reduce black carbon from cooking stoves, brick kilns and diesel vehicles, as well as methane, and HFC reductions. The CCAC recently released a guidance note on short-lived climate pollutant mitigation strategies to aid countries in developing their intended nationally determined contributions (INDCs) leading up to Paris. Mexico, the U.S., and most recently China, have released INDCs that include short-lived climate pollutants, and Chile has indicated it will follow suit. Figure. At 2100, aggressive mitigation of long-lived CO2 and short-lived climate pollutants can reduce sea levels by 35cm from the projected sea-level rise of 112 cm under business-as-usual. 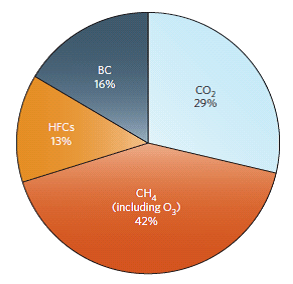 The pie chart shows percentage contribution of each pollutant. The Nature Climate Change commentary is here.